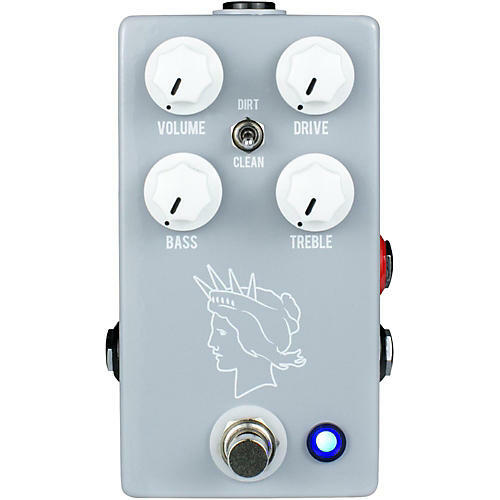 Add incredible, musical overdrive to your signal chain. In 1963, Silvertone introduced the 60-watt Model 1484 guitar amplifier. Originally a student-model amplifier, the amp’s gritty and unpolished tone has since made it legendary, hard to find, and coveted by some of the biggest names in music. And now, you get to put those same tones right on your pedalboard. If you love pedals that can perform two tonal jobs in one, you’re going to love the Dirt/Clean option JHS added to the “Twin Twelve” V2. In the Dirt mode, you’ll enjoy the gritty amp-like tones of the cranked Silvertone. Flip the switch to Clean, and you’re instantly bathing in the sound of a clean preamp that works great as a boost or as an always-on tonal enhancement. Dimensions: 2.2 x 4.8 x 1.6 in.